Cake & Heels: House of An's "Noodle-Off" + Great New Happy Hour Spot!! 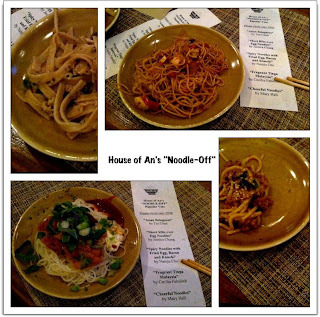 House of An's "Noodle-Off" + Great New Happy Hour Spot!! OK, let's first start with the House of An's "Noodle-Off" Competition... Celebrating the 30 year anniversary of Mama An's famous garlic noodles, which they still serve at their Beverly Hills mastery Crustacean, they held their first ever Noodle-Off competition at Tiato Garden Market Cafe in Santa Monica. 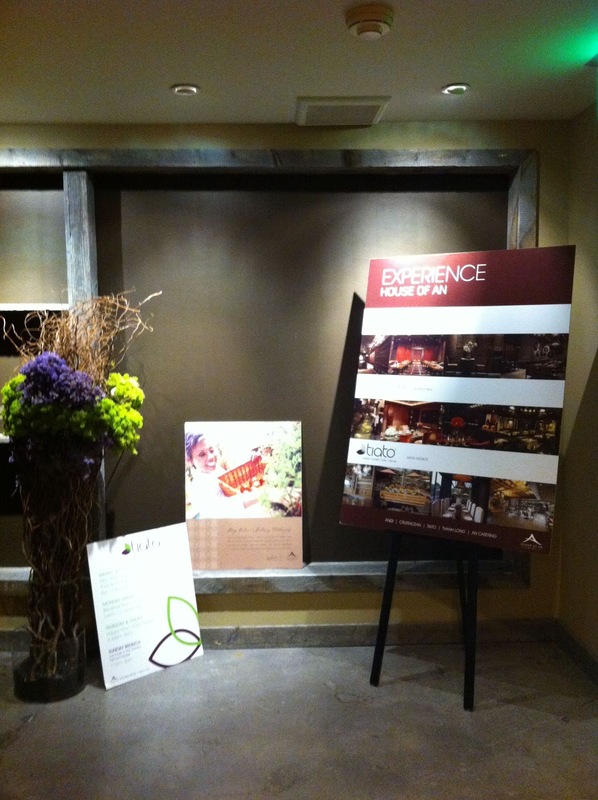 The winner received a $1,000 gift certificate to any of their restaurants & (more importantly) will have their prize winning noodles featured on all of the House of An menus! Five amateur chefs cooked their hearts out to a crowd filled with tons of foodie fans. From "Cheerful Noodles" (my personal favorite) to "Spicy Noodles with Fried Egg, Bacon & Kimchi" (because really, bacon just makes everything better) there were lots of different flavor palates to play with. Tze Chan's "Asian Bolognese" won the "People's Choice" award, partially due to an excellent marketing technique... including adorable I <3 Asian Bolognese Flags, and Cecilia Fabulich won the grand prize for her "Fragrant Tinga Malaysia!" AND NOW ON TO THE IMPORTING THINGS LIKE DELICIOUS HAPPY HOURS!! 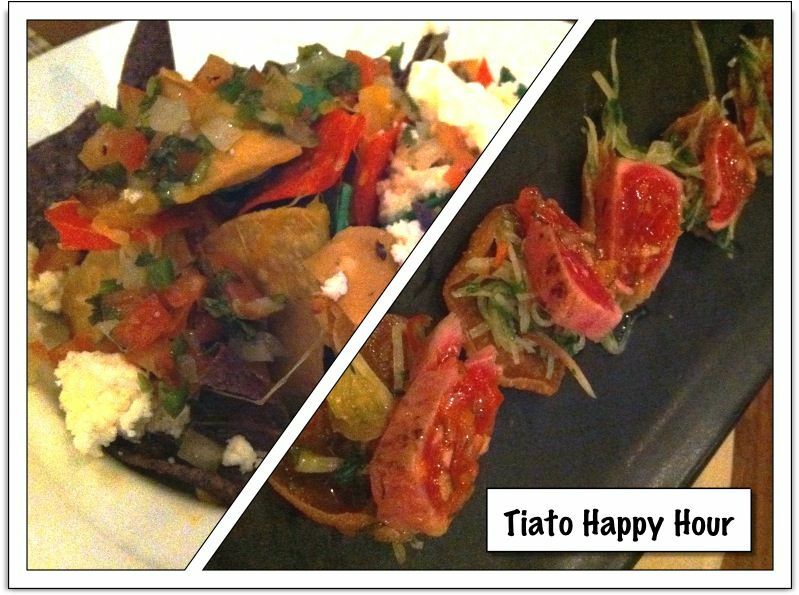 Tiato Garden Market Cafe has a wonderful Happy Hour from 4:30 to 8 P.M. on Thursday and Friday. What does that mean? $4 Brews / $5 Wines / $8 Cocktails + an array of delicious foods at very assistant friendly prices. And not just your requisite cheap-o beers, $4 Blue Moons, Firestones & Pilsner Urquells. For food we went with the Spicy Tiato Nachos for $6 + Hawaiian Seared Tuna Tacos for $8. The Nachos were a total hit IMHO, Spicy Chorizo, Salsa, & Queso Fresco... a little Asian flair on a Mexican dish... very Roy Choi-esq. Plus the bite sized morsels of seared ahi tuna joy were heavenly! I know I'm making this a new staple on the "where should we grab drinks" list. Especially because they validate for FREE PARKING as well! oh joy! When you're there be sure to say hi to (and tip well) Bartender Brent. Thanks so much for the comment on my Cheerful Peanut Garlic noodles! You made my day!